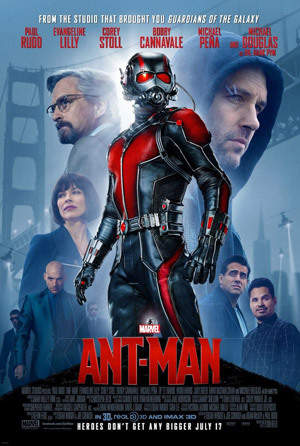 An ex-con electrical engineer with a social justice bent is recruited by rich inventor Hank Pym to take up his mantle as the new Ant-Man, the world's smallest superhero. Pym's former protoge has, as most proteges in movies do, gone bad, and Pym wants to stop him from selling his own tiny-warrior technology called Yellow Jacket. "Won't this lead to the same climax as 75% of all superhero movies: the hero fights a guy just like himself?" you ask. "Didn't Hulk fight other hulks? Didn't Iron Man fight other iron men? Didn't Cap the super-soldier fight other super-solders? Didn't Spider-Man fight an alien version of himself? Didn't Wolverine fight a female version of himself? Didn't the Man of Steel fight another Kryptonian?" Okay, so beyond the plot retread—which, to be fair, often worked fine in those other movies—was it fun? I like Paul Rudd in general, and the supporting cast was great. Rudd and the script bring just the right amount of humor and everyman pathos to the Scott character to let us feel engaged. This is not a Batman-style ink-blot psych test or Avengers-style world-threatening armageddon. As they say in the commentary, it's basically a heist movie, and it's therefore lighter and more fun. Scott's goofy friends bring more humor and a bit of Mission: Impossible atmosphere. Scott has a sweet little daughter that somewhat mirrors Hank's complicated relationship with his daughter. And there's a nice bit where Scott must retrieve something needed for the finale and the Falcon stands in his way. They have a nice tussle that shows off both their characters and powers well. The de-aging effect on Michael Douglas for early scenes is stunning, and the suit looks terrific. Ant-Man's powers of controlling ants and of shrinking and growing things other than himself are used well, and sometimes humorously. There are minor plot problems, tho. Scott's recruitment is overcomplicated, and most of the skills he displays are never seen again. This film does do the Ghostbusters "don't cross the streams" scene right (unlike Inception). The third act involves infiltrating an office building, and the characters genuinely worry about how the tiny superhero and some ants—including ones he can ride while they fly—are going to get in. There's lip service to the bad guy "closing the external vents", which is silly for an office building, but he also invites some of our heroes in thru the front door. They even somehow get a crony hired into a security guard position at the last minute! Even with "full-body scanners", are you telling me Scott and his ants can't get in hidden in the crony's shoes or flashlight? Hank smuggles an Abrams tank in! It's not a new building; it's Hank's old building. Doesn't he have a back door just for Ant-man? Isn't there a misaligned window frame? A stuck vent? A slim crack in the foundation? Bugs get into buildings all the time; just follow them! Infiltrating a building isn't a problem; it's your specialty! Scott decides to go in via "the water main", which is okay, but the Effects team decides he goes in thru the out door, and he jumps into a storm drain. Nevertheless, he comes out a restroom faucet, suggesting the villain can't keep storm runoff out of his drinking water, let alone Ant-Man out of his office building. Worse: a faucet turned off is water tight. What kind of entry point is that? There's some inadequately explained action (characters survive a multi-story fall inside the tank; the building explodes and then implodes; the villain puts on his suit in a few seconds during a fight inside a helicopter), but the pacing and humor keep the audience entertained, and i had more questions and beefs with The Force Awakens despite liking that as well. In short, i liked it a lot and look forward to more of Paul Rudd's Ant-Man and how he mixes with the Avengers and with the promised Wasp. Hey hey. Great review. Thanks man! Completely agree with your assessment, Zarban. Was really curious to see how it played out given all the apparently negative buzz and quite enjoyed it. Kids (and wife) liked it enough to get on blu-ray for Christmas. Funnily enough, the only other MCU film we liked enough to buy on blu-ray besides the two Avengers movies (because Joss Whedon) is Guardians, the other one that was supposed to be a big risk, which raises two important questions: (a) can nothing now stop the Marvel juggernaut? and (b) is this actually a good result -- that risk-taking seems to have been rewarded -- given that we're going to have these movies shoveled at us for the foreseeable future? I suppose the one thing that kind of irked me just a bit is the rather broad way the 'ethnic' characters are used for comic relief. It coulda been worse, yeah of course. And what the heck is up with San Francisco? It feels like it's suddenly everywhere (Big Hero 6, Inside Out, Ant-Man, The Man In The High Castle). And in ironic contrast to the terrible old-age makeup/effect on Martin Donovan (Mitchell Carson), who really is almost 60 years old, but basically hasn't aged a day since his films with Hal Hartley in the 90's. He must have a painting in an attic somewhere. Ha ha! Every time he was on-screen, I was thinking "Something's weird here. Is he old and they made him look young, or is he young and they made him look old?" I guess that's success?